Former Congressman Charles S. Gubser, who served in elected offices from 1950-1974, died Saturday at his home in Fresno. He was 95. Gubser was first elected to the State Assembly in 1950, serving in the 1951-52 Session, before serving in Congress from 1953-1974. 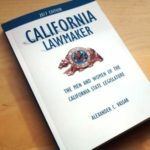 Since 1850, there have been 110 people who have served more than 20 years in the California Legislature.